Enchanting Cappadocia in Central Anatolia. A hikers' paradise and a unique cultural-historical miracle. Millions of years ago eruptions of volcanos covered Cappadocia, just west of Kayseri, with a colourfull layer of soft tufa and lava. Wind and water sculpted and polished fantastic rock formations and real works of art. Hittites, Christian monks, Byzantines and Ottoman people hid themselves in these canyons, carving out houses and frescoed churches. They even dug out giant underground cities from the soft rock. On foot, by bycicle, on horse back or hot air balloon: you'll be surprised by these pink hills, green valleys and fantastic forms. A true challenge full of new discoveries after every turn! 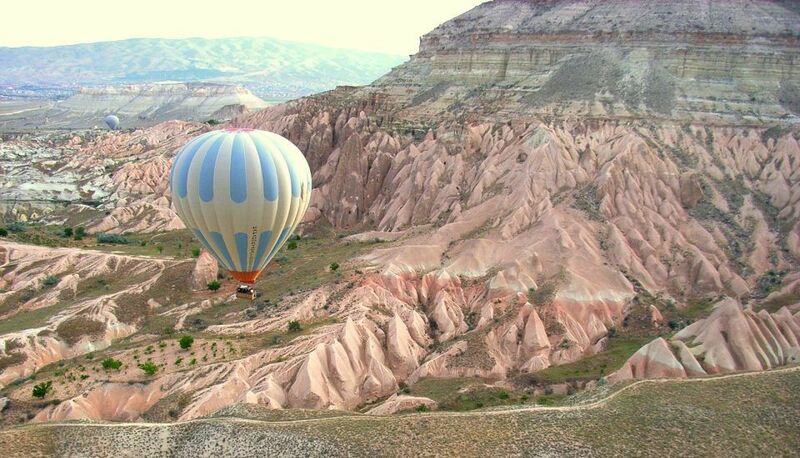 Göreme is situated in the centre of National Park Cappadocia, that is protected by the Unesco World Heritage List. There still are many inhabited cave dwellings in Göreme. It is a pleasant village fitted with modern conveniences but it has kept its authentic and cozy atmosphere. Besides restaurants, little shops, internet-cafés and terraces, you'll find quiet scenic alleys. Everywhere around Göreme you will discover a monumental landscape, full of "fairy-chimneys", cave houses and churches with frescoes. The lush valleys and pink and yellow hills are filled with singing birds, butterflies and wild flowers. Plenty of opportunities to shoot imaginative pictures.